This is a nice choice for Christmas Eve, to explain to young ones how Santa enters homes without chimneys, and great for Christmas Day when others are pondering the thought of how the “jolly guy” fit down theirs. Cuddle up with a warm cup of cocoa for this one! Publisher’s synopsis: Every year millions of letters to Santa reach the North Pole. Many are requests for presents. And many letters have questions about Santa, the elves and workshops, the reindeer, and, of course, the North Pole. Now Mrs. Claus has her own gift for you – for the first time ever, she’s taking a break from her very busy schedule to answer real questions from children of all ages. Join her on a tour of the North Pole and learn some of the best kept secrets of Christmas from the person who knows it all – Mrs. Claus! * How does Santa get into my house if we don’t have a chimney? * What is Santa’s favorite kind of cookie? Beautifully illustrated by David Wenzel, bestselling illustrator of Rudolph the Red-Nosed Reindeer, this picture book reveals the answers to the questions children always ask – and they’re all answered by the woman who knows the most: Mrs. Claus! 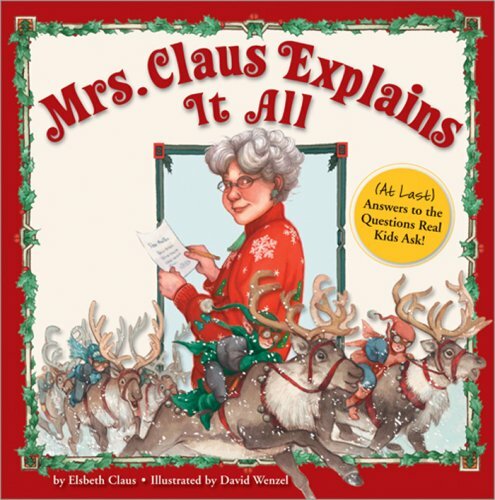 Add this book to your collection: Mrs. Claus Explains It All: (At Last) Answers to the Questions Real Kids Ask! If why does Santa come every year is the question you’ve been asked, this book may be what you’re looking for. It’s a Nativity based story line of Santa as a little shepherd boy and how he came to give gifts to baby Jesus and then to a child in need the following year. This story currently exists as a paperback, however, it is going to release in a coffee table version in 2010—I think this will certainly be the more visually appealing option. I liked this book: the text is simple, the message is sweet, and I think readers will be humbled. Leave us a comment: What great Santa or Christmas questions have your kids asked?